Moving out? 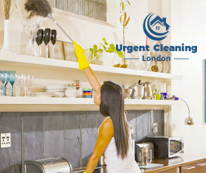 Use our end of tenancy cleaning service in London to put your property in tip-top shape for your landlord’s inspection. We are the best cleaning providers in London and we have cleaned a lot of lodgings throughout the years. Our service is characterised by effectiveness, high quality, punctuality, professionalism and low costs. We also offer a guarantee. If you are interested, make sure to dial our number straight away. We will give you a hand. Our end of tenancy cleaning service in London is 100% professional. Check out our testimonials to see what other people are saying about us. You will be surprised. Bedroom – beds vacuumed, floors swept and mopped; dressing table, bedside table and other furnishings cleaned; light switches sanitised; wardrobe cleaned from inside; shelves and cabinets dusted; knick-knacks dusted; mirrors cleaned; lamps and lampshades dusted; doors and door frames cleaned, door knobs sanitised; baseboards cleaned, radiators cleaned, cobwebs removed. Living areas – furniture vacuumed, shelves dusted, floors mopped; coffee table cleaned, window ledges cleaned and polished; radiators cleaned; pictures dusted; carpets vacuumed; windows cleaned on the inside; knick-knacks dusted; cobwebs removed. Bathroom – sink scrubbed and sanitised, de-limed and de-scaled; shower cleaned and de-limed; tub cleaned; toilet brushed and sanitised; toilet area cleaned and sanitised; bath tiles scrubbed; mirrors cleaned; floors scrubbed; shower curtain washed; shower cabin de-limed and cleaned; cabinets cleaned; windows cleaned on the inside, cobwebs removed. Kitchen – appliances cleaned (fridge and freezer cleaned from inside; microwave cleaned and wiped from inside and outside; oven degreased and cleaned on the inside and out; dishwasher and washing machine cleaned); floors swept and mopped, cobwebs removed, windows cleaned on the inside; tables and chairs wiped clean; countertops cleaned and sanitised, kitchen sink de-limed and scrubbed, taps sanitised; cabinets cleaned on the in and outside. Hallways and other areas – floors vacuumed, cobwebs removed, dust removed. This is all our end of tenancy cleaning service in London is about.